How is the IAS Campus laid out? The IAS campus is relatively small - it takes less than five minutes on foot to get from one side to the other - and our Members and visiting scholars typically walk or bike to their offices from housing. To get a sense of the campus layout, check out this map. What is Institute Housing like? Can I see a video of the IAS campus? Yes, you can see a video of the IAS Campus at this link. How does the Institute support partners who want to continue their own research while at IAS? The Institute for Advanced Study is committed to supporting not just our members’ research, but to making research resources available to their partners/spouses as well. Information about computing and library privileges, as well as funding identification support is available HERE. The Institute has numerous policies and practices in place to ensure that our Members and their families feel welcomed and supported throughout their time with us. From amenities like soccer fields and a playground in the housing area, to the Crossroads Nursery School and Infant Center, to family-focused events and programming throughout the academic year, IAS works hard to make members’ families feel welcome on campus. My partner/spouse will be at the Institute as a Member. If I come with them, can I hold a job during my time there? If you are a U.S. Citizen, or here on a Visa that allows you to be employed in the U.S., you can actively seek employment. For employment resources, click HERE. If you will be here on a Visa and are not sure if it permits employment, contact Jennifer Hansen (hansen@ias.edu) for more information. Does the Institute offer employment opportunities to members’ partners/spouses? While the Institute does not have a policy disallowing employment of members’ partners/spouses, positions are not specially created for such individuals. Should a partner/spouse apply for an open position at the Institute, their application would be given the same consideration as all other candidates. What will my social life be like on campus? The Institute for Advanced Study prides itself on being a residential campus, and works to ensure that members and their families have numerous opportunities to socialize. Organized events, including picnics and After Hours Conversations, and activities like pottery and yoga classes and community groups like English Conversation and Fireside Play Reading are ongoing throughout the academic year. A complete list of extracurricular activities at the Institute is available here. Informal gatherings happen on a regular basis both within housing and in public areas of campus including the lawn, woods, and around the pond. To learn more about social events on campus, contact Linda Cooper (llg@ias.edu) for more information. Where do people shop while living at the Institute? There are a number of shopping opportunities in the Princeton area. The Institute shuttle’s route stops at multiple shopping opportunities everyday, including the Quakerbridge Mall, Marketfair Mall, Wegmans, McCaffrey’s, Whole Foods, and Trader Joe’s. For purchases of previously-used items, including used cars and furniture, many members rely on Princeton’s local online classified site “Tiger Trade” and/or Craigslist. Is there a way to get groceries delivered to campus housing? Yes, and this service is becoming more and more popular among our visiting scholars, especially those without cars. There are several options for grocery delivery including: Fresh Direct, Peapod, and ShopRite. I’m coming to campus with one or more school-aged children, what are the schools like in Princeton? Children living on campus are eligible to attend the highly-rated Princeton Public Schools. In order for your child to attend, you will need to complete the necessary paperwork to enroll them in a timely manner, so it is best to familiarize yourself with the process and requirements as soon as you know you will be coming to campus. For more information about areas schools, visit the Princeton Public Schools website or contact Jennifer Hansen (hansen@ias.edu). I’m coming to campus with one or more young children, what are my daycare/preschool options? The Institute is home to Crossroads Nursery School and Infant Center. Very highly regarded, Crossroads allows preferential enrollment to members of the Institute community and members are eligible to receive reduced tuition for their children. Space is limited at Crossroads, reserve your child’s spot as soon as possible. What do I do if I need a babysitter while at the Institute? The Institute does not provide or endorse any form of babysitting services, which are generally acquired through private arrangements with local teens and other caregivers. To obtain a list of individuals who have provided babysitting services to Institute families in the past, contact Linda Cooper (llg@ias.edu). Babysitters can also be identified through third party websites, such as Care.com, SitterCity.com, and Care4Hire.com. These sites have no Institute affiliation and are not endorsed by IAS. I would like to improve my English conversation skills, does the Institute offer any resources to support me? Yes. The Institute for Advanced Study is an international organization, and recognizes that English is a second language for many of our members and their families. Apart from the many informal opportunities you will have to practice English while on campus, an “English Conversation Group” is held weekly, which partners/spouses are welcome to attend. In addition, two online resources – Mango Languages and Transparent Language – are available, both before you arrive and while you’re at the Institute. The Princeton YWCA also has a series of ESL courses, more information about which is available here: https://www.ywcaprinceton.org/programs/literacy-programs-esl/esl-2/. To gain access to language aquisition-focused library resources before arriving on campus, contact Institute Librarian Marcia Tucker (tucker@ias.edu) for assistance. My child is not a native English speaker, but will be enrolled in public school in Princeton. Are there any programs available to support them as they learn the language? What are my transportation options while on campus? If you come to the Institute with a personal automobile, you’ll find that numerous shopping, employment, and entertainment opportunities are within easy reach by road. Many members and their families are without a car while at the Institute, and rely on bicycles, the Institute Shuttle, and area public transit to get around. How do I get to New York City and Philadelphia from IAS campus? Both NYC and Philadelphia are easily reached from the Institute campus, either by personal automobile, or public transit. To plan your trip by car, consult Google Maps. Public transportation in New Jersey is operated by NJ Transit. To reach any of these destinations without a personal automobile, take the Institute Shuttle to the Princeton Train Station. From there you will catch the Princeton Shuttle (the Dinky) to the Princeton Junction Train Station. To reach Philadelphia, take the Northeast Corridor Line south (toward Trenton). In Trenton you will need to change to a SEPTA train, which will take you into the city (most major destinations are reachable from the Center City stops of Market East, Suburban Station, and 30th Street Station). To reach New York City, take the Northeast Corridor Line to its terminus at New York Penn Station. From Penn Station, points throughout the City and surrounding areas can be reached by subway, bus, train, taxi, and on foot. Public transit in New York City is operated by the MTA. How do I get to the Institute from the airport (and vice versa)? Due to proximity and ease of access, the Institute recommends using the Trenton-Mercer Airport, Newark Liberty International Airport, or Philadelphia International Airport if your travel plans permit. All three are reachable by car, and public transit options are available to Newark and Philadelphia airports. Where can I purchase items for my apartment? The IAS Shuttle stops at Walmart. In the same plaza as Walmart there is also a HomeGoods. The shuttle also stops at Wegmans, which sells some kitchen supplies and seasonal items for the home. Next to Wegmans there is also a Target. Numerous items can also be purchased online from retailers like Amazon, Overstock, and Wayfair, and many such sites offer free, or very low cost, shipping options for home delivery. My family keeps kosher. How can the Institute’s housing facilities accommodate our needs? The Institute will gladly furnish a second set of dishes to anyone who keeps kosher. For this and other matters related to keeping a kosher home at IAS, please contact Sharon Tozzi (stozzi@ias.edu). Does the Institute have accommodations for individuals with physical disabilties? Yes. The Institute campus and housing areas are fully compliant with the Americans with Disabilities Act, and the staff is happy to arrange additional accommodations as needed by our members and their families. For more information about accessibility on campus, contact Michael Klompus (mklompus@ias.edu). For more information about housing accommodations, contact Sharon Tozzi (stozzi@ias.edu). Is smoking permitted at the Institute? There are designated smoking areas across the Institute for Advanced Study’s academic campus and within member housing. When smoking, please be courteous of others in the area. Can I have supplies delivered to the Institute before my arrival? You may be able to have your own items (such as books) delivered to the Institute prior to your arrival. Please contact your School Administrative Officer to determine whether this is permissible. You can also preorder items (such as linens) for your Institute apartment. 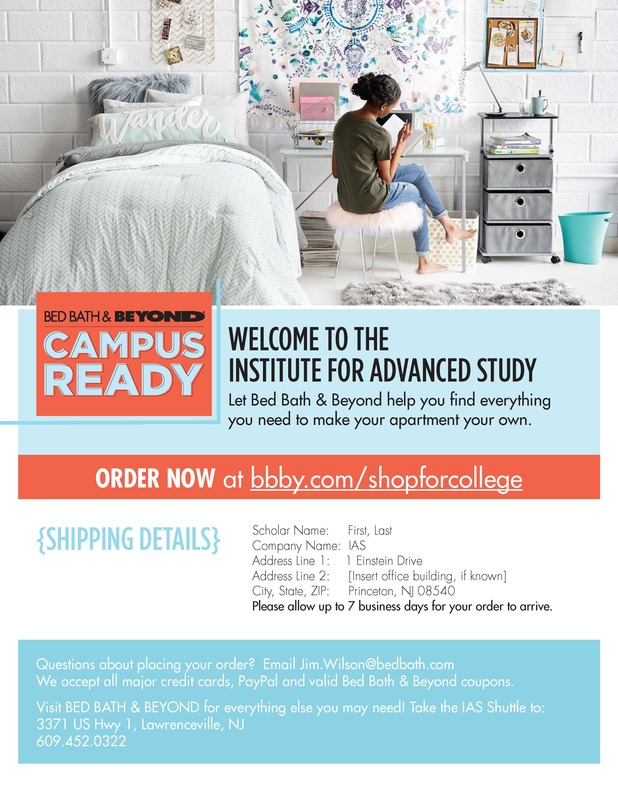 The Institute for Advanced Study has an arrangement with retailer Bed, Bath & Beyond, whereby you can purchase household items online, and they will be ready and waiting for you when you arrive on campus. To learn more about purchasing items from Bed, Bath & Beyond, see below.